Early attempts at ‘Hands Across America’ didn’t go well. Picard’s former archaeology professor and mentor, Galen (Norman Lloyd) asks Picard to join him on a super-secret mission. It would mean leaving the Enterprise, so Picard passes, and a disappointed Galen moves on. He is later killed when his shuttle is attacked, and Picard takes on the mysterious mission — which seems to be aimed at gathering DNA fragments from various worlds. Soon, the Klingons and Cardassians are involved (they apparently learned of Galen’s mission) and Picard gets the two rivals to work together. After some prerequisite deception — the Cardies try to sabotage the Enterprise and the Klingon captain (John Cothran) tries to bribe Data — they all end up on a lifeless planet, where the last remaining DNA fragment is found. Then, the Romulans show up — they’d been shadowing the Enterprise — and a faceoff appears imminent. 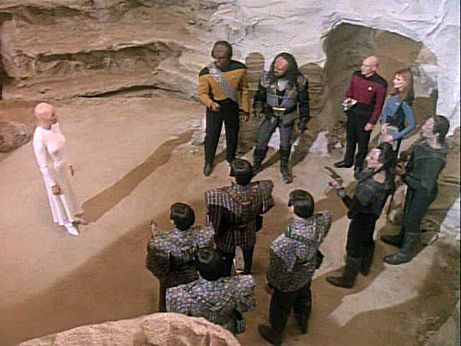 As the parties squabble with weapons drawn, Picard and Crusher extract the DNA and it activates an ancient hologram (Salome Jens) who tells the group that long ago her people spread their genetic material throughout space — possibly creating the bipeds we see all over Trek and hinting at the possibility that the races are somewhat related. The Klingons and Cardassians are unmoved, but the episode ends with the Romulan commander contacting Picard, saying perhaps they’re not that different after all. 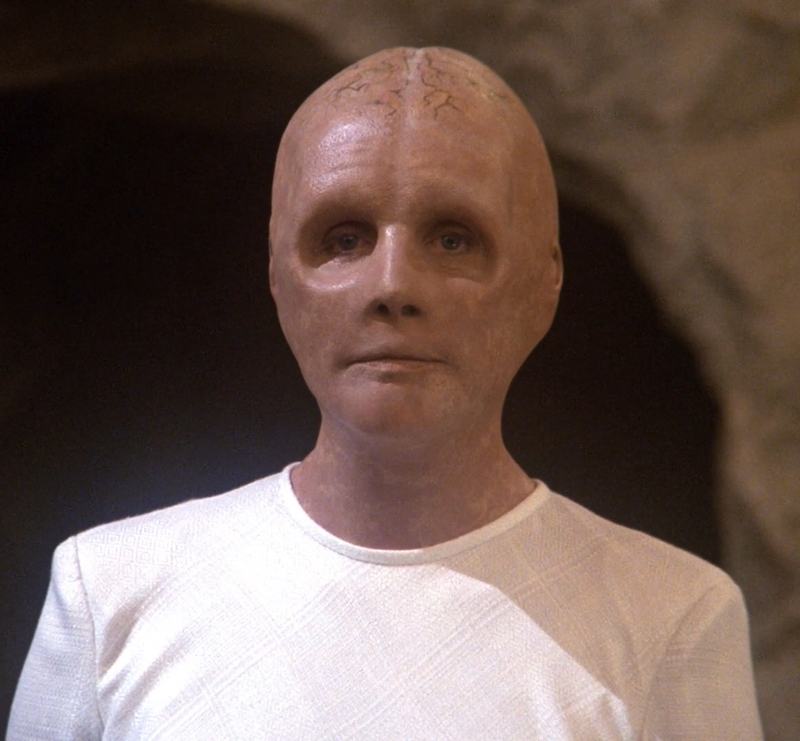 One of Star Trek’s biggest conceits has always been that most aliens look (basically) human. Aside from face makeup, Romulans, Klingons, Cardassians, etc., all have two arms and two legs. There are exceptions like the Tholians and the Sheliak. But by and large, Star Trek would be a lot harder to pull off if the aliens were more alien, so the concession is one we have to make, along the lines of the Universal Translator or Brent Spiner’s aging. This episode attempts to explain why a bunch of the aliens look the same. It’s not an ironclad explanation, as we’ll discuss. But this episode, quietly, tries to cover one piece of back story for the entire franchise. Beyond that, this episode is quintessential Trek as told by TNG. It involves problem-solving, getting feuding aliens to work together, Picard’s ability to think big picture and the hope that the commonalities among the aliens we encounter are more important than their differences. The last shot, where Patrick Stewart plays Picard as both hopeful and amazed after his conversation with the Romulan commander, is just about perfect. In short, there might not be another TNG episode that is so TNG. This has long been one of my favorite episodes of the franchise, as it’s engaging and comes with a message without being preachy. 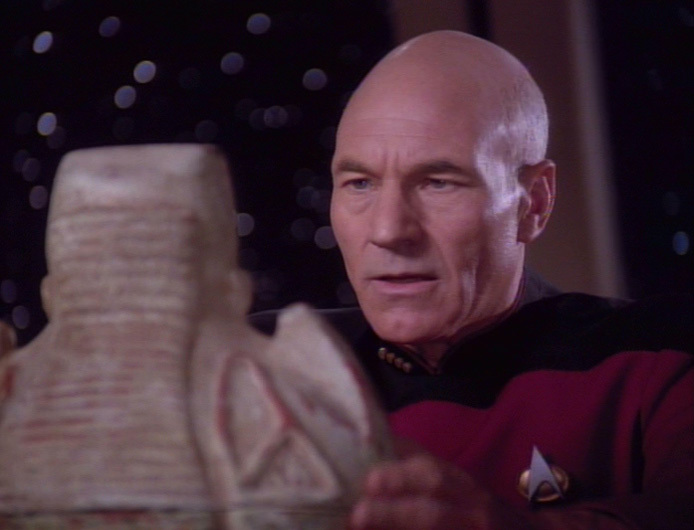 While this episode has a lot of TNG’s strengths, it also has some of its weaknesses. This isn’t the worst example of Fun With DNA (“Unnatural Selection” or “Genesis” wins that award) but it’s in the top 10. It’s also a little too easy at the end that the last fragment would reprogram the tricorder to display the holographic image just as everyone’s got guns drawn. It works dramatically, but it’s more likely that the ancient message would have to be decoded somehow. This episode also works for TNG, which largely takes place in the Alpha and Beta quadrants in (relatively) close proximity to Earth. But are we to believe that the ancient aliens planted DNA in the Gamma and Delta quadrants? We see bipeds from the Gamma Quadrant (on DS9) and from the Delta Quadrant (on Voyager) and we know from TNG that the Borg are essentially bipeds (a conglomeration of bipeds) from the Delta Quadrant. Maybe I could swallow that the ancient aliens had advanced propulsion, but did they have the time or interest to seed so much of the galaxy? The point is left vague as to whether all of the bipedal aliens descend from the ancient aliens, or if only some did. Also, I’m not sure why Galen didn’t just ask Picard to help him and use the resources of the Enterprise. Galen was clearly concerned about the dangerous implications of his findings — and it’s unlikely that the Federation would have refused him (particularly if Picard vouched for him). It sets up for the drama of the first act and the mystery leading up to the conclusion, as Galen would have likely clued Picard in at some point if they were working together. It’s possible Galen didn’t want the Federation or any paramilitary organization to be part of his discovery, but he never says anything like that. And hell, the Enterprise does in a few days what Galen says would take several months! The Klingon messiah returns. But is he still hanging with Genghis Khan?